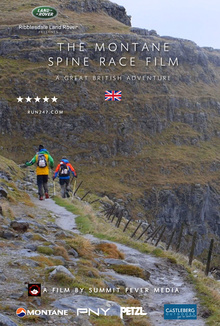 The Montane Spine Race: A Great British Adventure. The Montane Spine Race, referred to as, "Britain's Most Brutal Race", covers the 268miles of The Pennine Way, and is held each year in the midst of winter. This documentary follows the competitors as they battle through extreme winds, snowstorms, and torrential rain as they race along the Spine of Britain. Taking in some of the most remote and beautiful scenery the UK has to offer, the athletes have 7 days to complete the challenge, and to push their bodies and minds to the limits as they battle against sleep deprivation, extreme weather, exhaustion, & exposure. The extras only, the main film is not included in this bundle!